Game Boy modder and chiptune master Joe Heaton is here to give us an official on-the-floor report from an amazing musical event - enjoy! On February 12th 2016, Niche Nights hosted the first ever ChipBattles event at Fab Cafe in Manchester. This is a brand new event within the scene of "Chiptune" music, which can be loosely described as a style of electronic dance music produced using sound chips from hardware of yesteryear, typically Nintendo Game Boys. ChipBattles was the brainchild of the team behind the weekly Gameface Radio show. It was something that, as a group of friends, we had often discussed in a "wouldn't it be great if…" manner but then decided that in 2016 we were going to actually go for it. 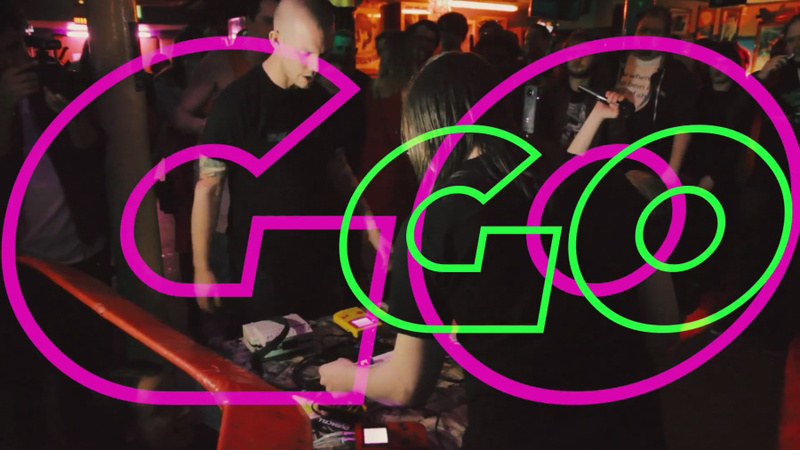 A live chiptune show is a sight to behold, pumping sounds from tiny hardware through a big sound system and drawing fans from the world over. Newcomers, however, are sometimes unsure of quite what to make of it. The idea behind ChipBattles was to give our beloved style of music a showcase in an accessible format that everyone could get behind and enjoy. Following many hours of discussion, planning and excitement, we settled on an event lasting approximately ten minutes, pitting two artists against each other in a one-on-one showdown via three rounds of sixteen bars of music in the artist's style of choice. The battle itself would be preceded by a short set from each artist, giving the audience a chance to choose their side. The software in question is called Little Sound DJ aka LSDJ, which is used to create and perform music and allows the audio output of two or more Game Boy consoles to be synchronised with a link cable. This enabled us to have a master track with a beat set to a predetermined tempo with the rounds of music flowing smoothly from one artist to the next. It was then down to Manchester resident Matt "Auracle" Whitwell and me under my "Joe Bleeps" moniker to kick off with the first ever battle. A big part of the plan was to try and build an online presence, so taunts were tweeted and pictures were teased in the weeks leading up to the event. We hammed it up as best we could, pro-wrestling style, with the emphasis on fun. On the night itself proceedings were led by Graeme "Gameface" Booth and professional cameras filmed the whole event. Over the next few weeks, the laborious editing process took place. The recently-launched Gameface YouTube channel was an integral part of the plan and we wanted the videos to become just as much of a phenomena as the events themselves. On the night, #TeamAuracle was crowned winner but I was stoked to have a vocal crowd showing their support for #TeamBleeps. We want to know what people think. It's now out there with a much wider audience and we want people to comment and show their support for both artists. We are already well on the way to planning the next ChipBattles event but speaking from a personal standpoint, for that first battle, I had a spectacular night. Great tunes, a fantastic crowd and a very talented opponent in the perfect venue. Roll on ChipBattles Round 2! In the meantime, please take a look at the video and leave your comments. We hope you like what you see and maybe we'll see you at a ChipBattle someday! That right there, that was awesome! So who wrote this, I'm confused? It changes from 3rd to 1st person so I'm assuming Nintendo life didn't organise the event but its written as though they did!?! @GH05T He goes by the name Chip! Bit! Sid! @sidrick13 Thanks <3 we've plenty more coming. So much beef out there. @GameFace cool stuff, cheers for the response. Just managed to blow my work mates minds with that video. Not sure they knew you could make a room dance with a game boy! Side note, any tips on where to find parts and mods for game boys as I'm building a couple and lots of the sites I use are out of stock. Especially back light kits for game boy advance and shells for game boy pocket? @ULTRA-64 Joe Heaton wrote the piece, he has done other content for Nintendo Life in the past. @ULTRA-64 Talk To Joe Bleeps, the writer of this. He's a modding wizard who's done some stunning work. @GameFace Any chance of getting some chip battles down south? Or am I gonna have to mish it back up to Manchester? I adore the sound effects of the original GameBoy. This was an interesting competition as both artists took very different musical approaches (both of which I greatly enjoy). "The software in question is called Little Sound DJ aka LSDJ,"
Why you don't mention Nanoloop, too? Which is basically similar to LSDJ. The main difference would be the interface. LSDJ is an so called "tracker" (means you type note values from top to bottom) whereas Nanoloop is a more intuitive "Step-Sequencer"
@phoebesck The article is written by one of the artists who performed at the event, pretty sure the research isn't lacking. It's about the event, not about chipmusic as a whole. @phoebesck The battle was restricted to LSDJ. The backing beat provided to both guys at the same time was on that and both battlers were specifically told to use LSDj. They were also only allowed one DMG each, even playing field. yeah, i see. should've read teh article more carefully.